The Boy from Oz is a jukebox musical based on the life of singer and songwriter Peter Allen, featuring songs written by him. The original book is by Nick Enright, with a revised book by Martin Sherman. Premiering in Australia in 1998 starring Todd McKenney, the musical opened in a revised version on Broadway in 2003 with Hugh Jackman in the title role. The musical begins with Australian performer Peter Allen recalling his life story, coming to terms with who he was ("The Lives of Me"). Afterwards, we go back to Allen's childhood in Tenterfield, Australia, where a young boy named Peter Woolnough is performing in local bars for money ("When I Get My Name in Lights"). Peter grows up and joins with Chris Bell to become the Allen Brothers, and they perform in Australian Bandstand ("Love Crazy"). After great success in Australia, the Allen Brothers perform in a Hong Kong Hilton hotel to Chinese businessmen. One evening, another person is watching them from the bar: the legendary Judy Garland. Peter convinces Judy to perform with them ("All I Wanted Was the Dream"), and Judy takes Peter to be the opening act in her concert in New York ("Only an Older Woman"). While in New York, Peter is introduced to Judy's daughter, Liza, and they fall in love ("Best That You Can Do"). There are rumors of Peter's homosexuality, and Judy warns Liza of this ("Don't Wish Too Hard"). Liza gives no attention to her warning and marries Peter ("Come Save Me"). Peter makes some mistakes, and at one of his all night parties Liza walks in on him ("Continental American"), further fueling her suspicions that he is gay. Liza is working hard to get her career going ("She Loves to Hear the Music"), in contrast to Peter's excessive lifestyle. Judy dies, and Peter honors her ("Quiet Please, There's a Lady on Stage"). Liza's world comes crashing down as a result of her mother's death. Liza confronts Peter on his alleged homosexuality, and their marriage ends ("I'd Rather Leave While I'm in Love"). Peter returns to Australia but realizes that he is not who people thought he was ("Not the Boy Next Door"). Back in the US, Peter has gone solo and comes to terms with his bisexuality ("Bi-Coastal"). He meets the hardworking fashion model Gregory Connell. Greg does not want to be a part of Peter's life in show business, but he falls in love with Peter ("If You Were Wondering"). They soon get discovered by music producer Dee Anthony, and he gets them a gig at the Copacabana in New York ("Sure Thing Baby"). Peter's career takes off, and he wins an Oscar for Arthur's Theme, in addition to recording songs that were covered by artists Olivia Newton-John and Frank Sinatra. Peter gives his best performance in the Radio City Music Hall with The Rockettes ("Everything Old is New Again"), and is surprised to know his mother is also in love. Greg becomes stricken with AIDS, and even though Peter tries to help him carry on, he succumbs to his illness ("Love Don't Need a Reason"). Peter also becomes sick with AIDS, but Greg's spirit urges him to carry on ("I Honestly Love You"). Liza offers her support to Peter, and they both realize they had successful lives and careers without each other ("You and Me"). Peter returns to Australia for a triumphant performance ("I Still Call Australia Home") and tries to tell his mother about his illness, but he can't find a way to tell her ("Don't Cry Out Loud"). Peter succumbs to his disease, and he reflects on his life realizing he has no regrets as he passes away ("Once Before I Go"), but not before going out in style with a farewell performance ("I Go to Rio"). 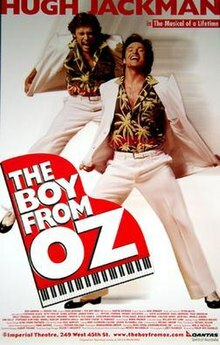 The Boy from Oz had its world premiere, directed by Gale Edwards, at Capitol Theatre, Sydney, Australia, on 5 March 1998 and toured Brisbane, Melbourne, Adelaide and Perth, playing to over 1.2 million theatre patrons. It ran for a total 766 performances over two years. The production starred showman Todd McKenney as Peter Allen and Divinyls frontwoman Chrissy Amphlett as Judy Garland, Angela Toohey as Liza Minnelli and introduced Mathew Waters as Young Peter Allen. The Boy from Oz began previews on Broadway at the Imperial Theatre on 16 September 2003 and opened on 16 October 2003. It closed on 12 September 2004, at the end of Hugh Jackman's contract. It was adapted for the American audience by playwright Martin Sherman, who removed some of the Australian terms (such as "jackaroo") and expanded the role of U.S. characters Garland and Minnelli. The musical played 32 previews and 365 performances. Directed by Philip William McKinley, with choreography by Joey McKneely, it starred Jackman as Peter Allen, Isabel Keating as Judy Garland, Stephanie J. Block as Liza Minnelli, Beth Fowler as Marion Woolnough, Jarrod Emick as Peter's lover Greg Connell, and John Hill as Mark Herron (Judy's husband). Jackman won the 2004 Tony Award for Best Leading Actor in a Musical and the Drama Desk Award for Outstanding Actor in a Musical, and Keating won the Drama Desk Award for Outstanding Featured Actress in a Musical. The show also received nominations for four other Tony Awards, including Best Musical. Ben Brantley of The New York Times panned the show, calling it an "indisputably bogus show", but praised Jackman's performance. The musical recouped its investment of $8.25 million. The Boy from Oz returned to Australia from 3 August 2006 to 10 September 2006 in a new production especially designed for the arena stage (audiences of over 10,000 people), called Boy from Oz Arena Spectacular. Directed by Kenny Ortega, Hugh Jackman reprised his New York role as Peter Allen. He was joined by Australian actresses Chrissy Amphlett and Angela Toohey, reprising their roles as Judy Garland and Liza Minnelli. Shardyn Fahey-Leigh played the role of Young Peter Allen with Dylan Speedy. Rarmian Newton and Joshua Waiss Gates, both of whom later starred in Billy Elliot the Musical, were understudies in the Australian production. Peter's mother, Marion, was played by Colleen Hewett. The show had a support cast of 40 singer-dancers and a 25-piece orchestra. The show also featured the vocals of Australian girls' high school choirs from Penrhos College when in Perth, and, while in Sydney, Melbourne, Adelaide and Brisbane, it featured the vocals of 100 girls from the Australian Girls Choir. In 2010 Todd McKenney returned to the title role with The Production Company in a version of the show that climaxed with a Peter Allen recording projected on the stage. In 2018 to celebrate The Boy from Oz turning 20, The Production Company staged a new production with anachronistic elements such as Aboriginal and rainbow flags. Rohan Browne starred as Peter Allen, with Caroline O’Connor as Judy Garland and Matthew Manahan as Greg Connell. In Peru, the musical was released in May 2013, starring Marco Zunino as Allen, Érika Villalobos appeared as Liza Minnelli and Elena Romero as Judy Garland. It was the first Spanish language adaptation of this musical. The Broadway production received favorable reviews. In his review for The New York Times, Ben Brantley wrote, "His limbs twirling like the blades of a windmill, Mr. Jackman channels the energy that was Allen with a rejuvenating life force all his own. And you don’t feel — as you so often do with such interpretations — that your memories of the prototype have been blurred. This is a performance that, against the odds, holds on to its integrity." Variety, writing about the Australian arena tour, said, "When he first performed the role on Broadway in 2003, Hugh Jackman’s charisma, vitality and breezy confidence onstage far outshone the narrative or emotional scope of the by-the-numbers biomusical of singer-songwriter Peter Allen. The scales have been tipped even further toward the performer in this pumped-up reconfiguration of the show, playing state capitals in venues of 10,000 seats or more. It’s as much a concert platform for a returning local boy made good in Hollywood as it is a life story of Peter Allen. And that’s no bad thing." The original Australian production was also received six Melbourne Green Room Awards for 1999, including Outstanding Contribution by a Music Theatre Management. It was also nominated for the Green Room Award for Best New Australian Play. ^ "The Boy from Oz: Synopsis". Stacy's Musical Village. Archived from the original on April 15, 2012. Retrieved November 13, 2017. ^ "The Boy From Oz... in Oz". Audiomastermind.com. Archived from the original on July 26, 2012. Retrieved November 13, 2017. ^ "The Boy from Oz". Internet Broadway Database. Retrieved November 13, 2017. ^ a b Brantley, Ben (October 17, 2003). "Theater Review; Flash Of 70's Sequins". The New York Times. Retrieved November 13, 2017. ^ Green, Jesse (September 5, 2004). "Theater: Debriefing; Eight Days a Week". The New York Times. Retrieved November 13, 2017. ^ "The Boy From Oz". Australian Broadcasting Corporation. September 4, 2006. Archived from the original on March 6, 2008. Retrieved November 13, 2017. ^ a b Rooney, David (August 6, 2006). "Abroad: The Boy from Oz". Variety. Archived from the original on December 1, 2009. Retrieved November 13, 2017. ^ Hernandez, Ernio (February 13, 2006). "Hugh Jackman The Boy From Oz Tour Gets New Director, Cast and Dates for Oz Return". Playbill. Archived from the original on June 26, 2006. Retrieved November 13, 2017. ^ "Musical de Broadway "The Boy From Oz" será adaptado en Lima". El Comercio. December 17, 2011. Retrieved November 13, 2017. ^ Rooney, David (6 August 2006). "The Boy from Oz". Variety. Retrieved November 13, 2017. ^ "1999 Music Theatre". Green Room Awards. Archived from the original on November 29, 2003. Retrieved 20 March 2016. ^ "1999 Drama". Green Room Awards. Archived from the original on November 26, 2003. Retrieved 20 March 2016. Judy Garland was an American actress, singer, dancer, and vaudevillian. During a career that spanned 45 years, she attained international stardom as an actress in both musical and dramatic roles, as a recording artist, and on the concert stage. Respected for her versatility, she received a juvenile Academy Award, a Golden Globe Award, and a Special Tony Award. Garland was the first woman to win the Grammy Award for Album of the Year for her live recording Judy at Carnegie Hall (1961). Liza May Minnelli is an American actress and singer. Best known for her Academy Award-winning performance in Cabaret (1972), she is known for her energetic stage presence and her powerful mezzo-soprano singing voice. She is the daughter of Judy Garland and Vincente Minnelli. She is of Italian and mixed European descent. Fred Ebb was an American musical theatre lyricist who had many successful collaborations with composer John Kander. The Kander and Ebb team frequently wrote for such performers as Liza Minnelli and Chita Rivera. Cabaret is a 1972 American musical drama film directed by Bob Fosse, and starring Liza Minnelli, Michael York, and Joel Grey. Lorna Luft is an American television, stage, and film actress and singer. She is the daughter of singer and actress Judy Garland and producer Sidney Luft, and half-sister to singer and actress Liza Minnelli. Vincente Minnelli was an Italian-American stage director and film director. He is remembered for directing such classic movie musicals as Meet Me in St. Louis (1944), An American in Paris (1951), The Band Wagon (1953), and Gigi (1958). An American in Paris and Gigi both won the Academy Award for Best Picture, with Minnelli winning Best Director for Gigi. 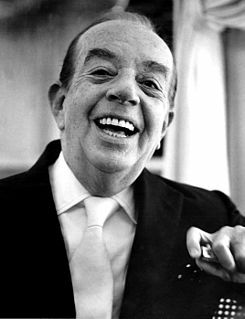 In addition to having directed some of the best known musicals of his day, Minnelli made many comedies and melodramas. He was married to Judy Garland from 1945 until 1951; the couple were the parents of Liza Minnelli. Kay Thompson was an American author, singer, vocal arranger, vocal coach, composer, musician, dancer and actress. She is best known as the creator of the Eloise children's books and for her role in the movie Funny Face. Todd McKenney is an Australian entertainer. He is best known for portraying Peter Allen in the musical The Boy from Oz and as a judge on Australian television show Dancing with the Stars. "Don't Cry Out Loud" is a song written in 1976 by Peter Allen with lyricist Carole Bayer Sager that is best known as a hit single for Melissa Manchester in the US and for Elkie Brooks in the UK. "Tenterfield Saddler" is a song written by Peter Allen in 1970. It was released in 1972 as the second single from his second studio album of the same name. David Harris is an Australian actor and singer, currently based in New York City. He is best known for his Australian performances as Chris in Miss Saigon, Fiyero in Wicked and Emmett in Legally Blonde having received Helpmann Award nominations for all three leading roles. Harris also starred as the Baker in Victorian Opera's production of Into the Woods and, in America, as Jean Valjean in Les Misérables opposite Terrence Mann in 2015. He has released two solo albums. Minnelli on Minnelli: Live at the Palace was a concert presented by Liza Minnelli at the Palace Theatre on Broadway from December 8, 1999 through January 2, 2000. The show consisted of songs featured in films directed by her father, Vincente Minnelli (1903-1986). This article is a list of recordings made by Judy Garland. Throughout her career Garland recorded numerous soundtracks for her films, as well as studio recordings for Decca, Columbia and Capitol Records. In addition to these soundtrack and studio recordings, Garland would also perform numerous songs on her 1963–1964 CBS television series, The Judy Garland Show, with an array of famous guest performers. Garland also performed countless times on the radio and gave hundreds of concerts throughout her career, many of these performances were recorded and have survived in audio format.